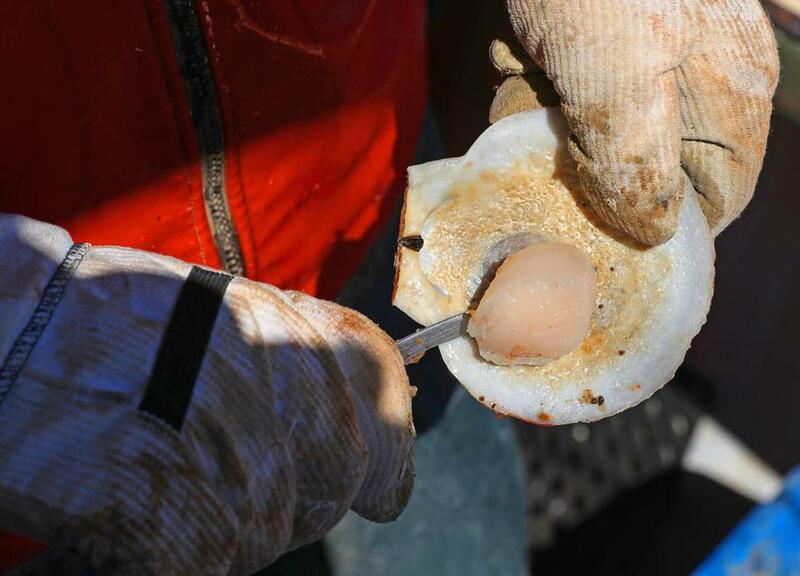 Captain Jim Wotton shucked a scallop fresh from the water on board his 45-foot fishing boat Overkill Time. Competition from larger boats is pressuring him. 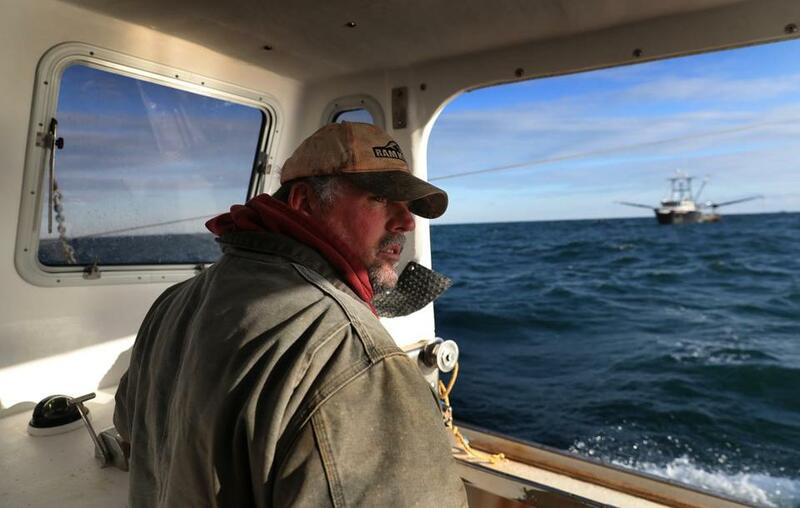 Since the start of the scallop season this month, Jim Wotton has dragged heavy dredges along the seabed off Gloucester, hauling in as much as 200 pounds a day of the valuable clams, the area’s federal limit for small-boat fishermen. Now, to his dismay, dozens of larger, industrial-sized boats have been steaming into the same gray waters, scooping up as many scallops as they can. Unlike their smaller counterparts, the large vessels have no quota on the amount they can catch; they’re only limited by the number of days they can fish. It’s a regulatory loophole that small-boat fishermen fear could wipe out the resurgent scallop grounds in the northern Gulf of Maine. This year, officials at the National Oceanic and Atmospheric Administration estimate that the large boats are likely to catch about a million pounds of scallops – roughly half of the area’s estimated stock. In recent years, Wotton and other small-boat fishermen mostly had the waters to themselves. But as the fishery has rebounded, the large boats returned in force, last year pulling up 290,000 pounds of scallops – more than four times the quota for small boats in the fishing area. Wotton and other small-boat fishermen, along with a range of public officials in Maine, have urged NOAA to close the fishery immediately. They have been fishing there since 2008, when officials carved out the area to help small-boat fishermen. 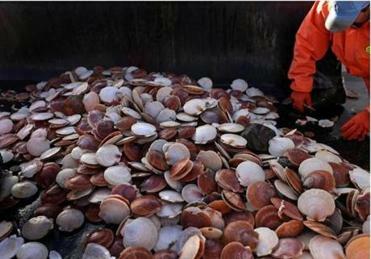 He pointed to an assessment last summer by the Maine Department of Marine Resources that suggested the fishery would become unsustainable if the area’s scallop catch exceeded 480,000 pounds. The large-boat haul, he added, was threatening the livelihoods of more than 100 small-boat fishermen. On board the 45-foot Overkill Time, crew member Harlan Simmons worked with scallops just dredged up from the sea. 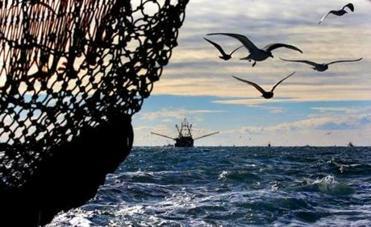 NOAA officials acknowledge the fishermen’s concerns, but have declined to take emergency action to close the fishery. On Tuesday, however, NOAA regional administrator John Bullard told the Globe the agency plans to close the fishery as soon as Thursday, saying that small boats will have reached their quota by then. The fishery automatically closes – to all boats – once the small boats catch their annual quota of 70,000 pounds of scallops. Bullard said NOAA has expedited the opening of three other scallop fisheries off Nantucket, New Jersey, and the eastern side of Georges Bank off Massachusetts. He said it would have taken about a month to carry out an emergency closure. “We weren’t sure when we could close the area, because weather has tremendous impact on when the small boats fish,” he said. 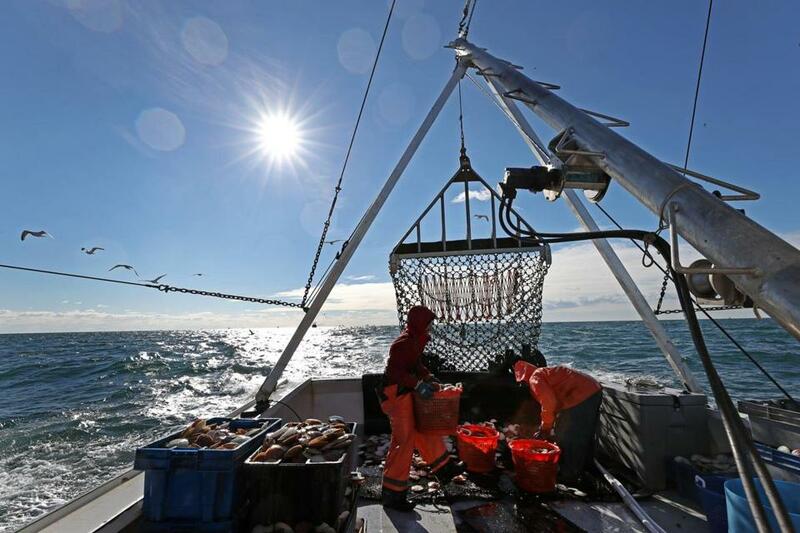 In the coming months, he expects the New England Fishery Management Council, which oversees the region’s fishing industry, to consider changes to how often large boats can fish in the area. The council could designate the northern Gulf of Maine an “access area,” meaning that the larger boats would only be allowed in every few years, once the fishery reached a certain abundance. Small boats could continue to fish there under strict limits. Despite their slow rebound in the northern Gulf of Maine, scallops have been thriving elsewhere and have become one of the nation’s most lucrative fisheries. In 2015, fishermen landed $438 million worth of scallops – more than any other seafood besides lobster and Alaska walleye pollock, according to the latest figures. Representatives of the larger boats say they have every right to fish in the area, and insist their catch won’t threaten the fishery. 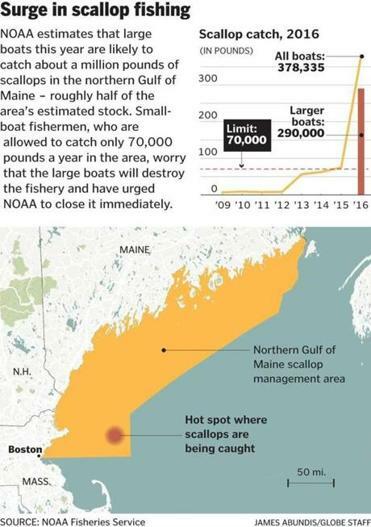 They also question Maine’s estimate of the size of the scallop fishery, saying their recent catches suggest the stock is significantly larger. Even if they harvest half the fishery, that would be a sustainable level, they said. Jim Wotton, captain of Overkill Time, sees a threat from large fishing boats that don’t have quotas. “It allows the fleet to harvest scallops ... during the optimal spring fishing season,” he said. Still, Minkiewicz and other representatives of the larger boats called for a “comprehensive solution” that would integrate the northern gulf into the larger scallop fishery. Most scalloping areas open and close every few years on a rotating basis, based on the health of the clams. The lack of such a system in the northern gulf allows the big boats to fish there every year. “We need to think long and hard about the ideal way this should be done,” said Mary Beth Tooley, a spokeswoman for the O’Hara Co. in Rockland, Me., which operates larger boats, and a member of the fishery management council. In the meantime, NOAA officials said the opening of the additional scallop fisheries should relieve pressure on the northern gulf. But they want to find a better way to manage the fishery in the future. Martens said he was relieved that NOAA plans to close the fishery this week, but worries the damage may have already been done. “We may have lost 20 years of rebuilding in the past, and the next 10 years of fishing future,” he said. Crew members Ryan Schultz and Harlan Simmons worked on board Overkill Time.